Lock in a great price for Che Lagarto Hostel Ipanema – rated 8.4 by recent guests! Best place if you are traveling by your self. You will meet incredible people and have lots of fun. The hostel is very clean, bed sheets are changed every day, it is very good located near Ipanema Beach, Jardim de Alah metro station, shopping Leblon, bars, restaurants and main street. Free caipirinhas are offered to the guests during half hour which is great and the hostel environment is awesome. Staff are great! I should stayed a few more days. Great location of course. Photos our private room were accurate. Nice staff willing to help out and kept the whole place clean, including the room. Our room was actually located in a different building from the reception literally just across a residential street (less than 10 m), which we liked because it tends the reception/bar area tends to be quite loud at night. The bar is also a nice place to meet people from all over South America and Brazil provided your Spanish or Portuguese are decent enough. The free drinks were great too. Friendly staff and perfect location. Less than 2 blocks from Ipanema beach! One of our best sellers in Rio de Janeiro! 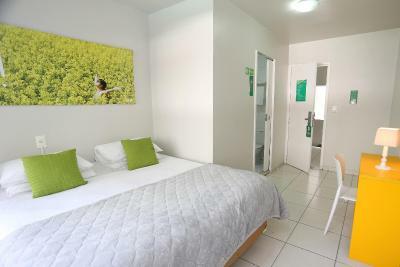 Located just one block from Ipanema Beach, Che Lagarto Ipanema offers comfortable dormitory rooms with air conditioning. Facilities include a tour desk and a ticket service. All rooms of Che Lagarto Ipanema enjoy a simple interior. The rooms on the top floor offer panoramic views of the sea. Guests can benefit from the convenient 24-hour front desk service Ipanema Che Lagarto provides. The hostel also has a TV lounge. H. Stern famous jewelry museum is only 3 blocks away, Jardim de Alah Park is 650 feet away and Rodrigo de Freitas Lagoon is 1,300 feet away. When would you like to stay at Che Lagarto Hostel Ipanema? 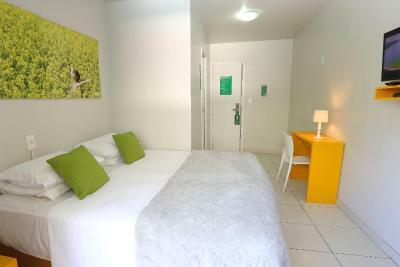 Located in the annex building, this double room has air conditioning, private bathroom and a TV. Please note that this room is only accessible by stairs. Area Info – This neighborhood is a great choice for travelers interested in beaches, sandy beaches and beach walks – Check location Excellent location – show map Guests loved walking around the neighborhood! House Rules Che Lagarto Hostel Ipanema takes special requests – add in the next step! Che Lagarto Hostel Ipanema accepts these cards and reserves the right to temporarily hold an amount prior to arrival. Considering the price we paid for a double room, it was a total disappointment. The room was very small and looked like it hasn't been renovated for at least 10 years. The hostel has a nice balcony but a relatively small common area. The hostel. staff was nice but very uninformative and they barely spoke English. They have luggage storage but it's very unorganized, they just stack luggage behind the front desk and they don't tag it so it's a bit unsafe. The hostel was in a pretty noisy area, and the hostel itself was loud with guests shouting and making noise all night. Limited space in shared areas, mediocre breakfast, and rooms were a bit gloomy. The staff were friendly and helpful. It was close to the beach and to the metro for going further distances. Key cards very sensitive to metal objects, had to get a new one three times in two days. I was missing a proper hangout area besides the couches in the first floor. 15RL extra for breakfast, didn't take it and heard its not very good. Cheaper to eat out in a Padaria. My private room need to be better equipped - hooks, etc. the shower to be adjusted. Beer on the bar could be more like Brewdog or craft. Staff were all really helpful, amazing social atmosphere in the evenings which is perfect for meeting people if you’re travelling solo. Seriously one of my favourite hostels ever! Great hostel near the beach with extremely friendly staff and a nice common area which invites meeting people. Caipirnha for free for half an hour at 7:30, which makes all the hostel come and meet at that hour. Many tours are offered. Not many negatives - one bathroom in ten bed dorm was not enough and there are no extensive communal facilities to use to combat this. Noise from the bar at night may be bothersome for some people at it seemed many from other hostels around gathered here for the party so the crowds were big! 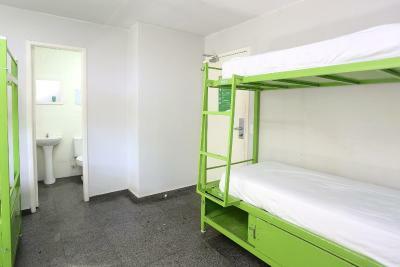 The hostel is very clean, with rooms cleaned daily. The location is good - two blocks from the beach and close to supermarkets, restaurants, metro etc. Kitchen facilities were spotless and well equipped and there was a nice lounge area to consume any food cooked in the kitchen or to relax. Breakfast was excellent - the best I’ve had in South America and the bar facilities were great, with big crowds gathering in the evenings! Excellent WiFi also. Really helpful staff, awesome location and just 1 minute from the beach. There is a great atmosphere and lots of fun at the bar so it’s really easy to meet people! Interaction with guests, lots of fun. The location was so close to the beach and there’s a lot of shops nearby! The guy at the reception, Daniel was incredibly helpful! Thank you so much!